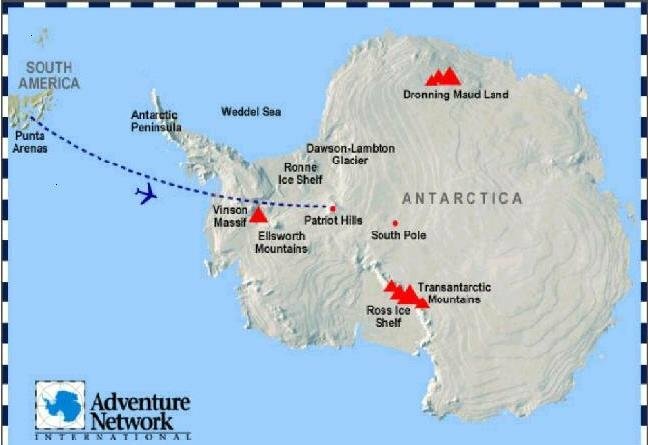 This is the route of our expeditions to Antarctica, more maps soon. You will be flown from Punta Arenas, Chile to Patriot Hills, Antarctica and, if the weather at Vinson is deemed suitable, you may fly out the same day. The final leg of the flight to the Vinson base camp takes about 1 hour and twenty minutes in one of our ski-equipped aircraft.